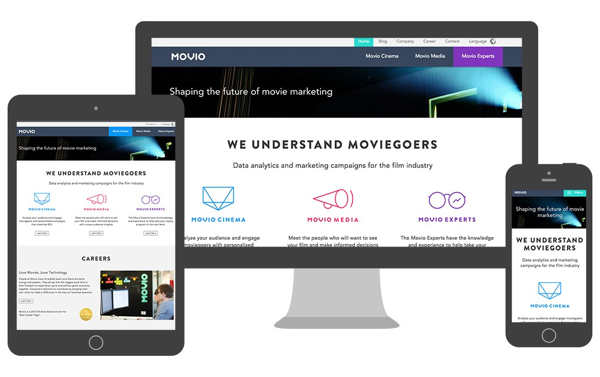 Movio provides marketing data analytics for the film industry, giving their customers (cinemas, distributors and studios) with insights into the behaviour of the moviegoing audience public, and tools to engage with them. With a range of products that evolve rapidly, Movio needs to communicate effectively with its customers about their development and how they can be used. An important part of this engagement is their blog, with articles by a number of different authors published several times a month. Their blog was running on WordPress, but was starting to show its limitations and becoming less easy to manage. Meanwhile, WordPress itself has increasingly attracted unwelcome attention for security weaknesses. The rest of the Movio website was handled entirely separately from the blog, in hard-coded HTML files, making site updates needlessly complex. Movio needed a way out of these two dead-ends, to a system that could be relied upon to grow flexibly with the company and accommodate new publishing requirements. Though they had no prior Django experience within the company, the advantages that Python and Django offered over PHP and WordPress made the investment in the new technology seem worth it, and the added benefits of our Divio Cloud hosting completed the package. Migrating material from a WordPress site is not always easy - it can sometimes be reluctant to yield its content and metadata, despite ostensibly offering export functionality. Fortunately we are familiar with its many tricks, and were able to automate the vast majority of the migration. Moving our website and blog to django CMS enables our digital marketing team to be autonomous, improving our daily operations and agility. The new site runs django CMS, with a number of integrated applications, including Aldryn News & Blog, to handle all the new content. The different parts of the site have been unified into a single platform, along with a single frontend. Their existing frontend setup, including a custom grid layout system, SASS and gulp, were all easily integrated into django CMS’s publishing model. Mostly, Movio were able to use our standard, well-tested open-source Django applications, but in one or two cases adaptations were required to meet their requirements. It’s a testament to Django’s flexibility that we were able to provide the extra functionality required without modifying the applications, but by creating new minimal packages to extend them. This will guarantee the Movio site easy upgrade paths as new versions of the applications are released. Movio’s project was delivered in short order, despite some technical challenges. The new site represents an open, stable and extensible platform that will provide service for many years to come. Its Django underpinnings offer guarantees of performance and security simply not available from PHP, however rapidly it needs to grow, and whatever new functionality might be created for it. Thanks to the Divio Cloud hosting platform Movio need no longer be concerned about their own hosting capacity, or be troubled by the distractions of managing it. Their Managed Cloud package provides uptime guarantees, and our “soft limits” policy means that they don’t need to anticipate sudden spikes or ramps in demand. As Movio grows, their project’s hosting demands can grow indefinitely with them, and will be met easily by our vastly-scalable infrastructure.